Ray, this is an extremely strong performance! I’m always calculating the ELO numbers parallely on a different method which is slightly better in my opinion. - I use every single game to calculate the rating (thus I use more information). - The k-factor is only 3. - If a player resigns a game he loses only one single game. - The ELO numbers are assigned to the day as the game started not when it ends. You have the second-highest peak value EVER in this rating – behind luiser together with Telestes. Where I must say that Kitaktus, Theo and Jean Hebert had probably reached a similar high ranking if they had made more games. luiser reached also the 1950 in the LG rating. In the first moment you think that a (double round robin) 7-points-tournament would produce reasonable results. But if you take a closer look, you can see that 2 players stopped playing in this tournament, TUMRAK and pgadey. Both together gave 240 points to the others. While looser (e.g.) and I finished at least 2 × 6 single games against pgadey before he/she resigned all games, your games ended 0:1 both. Most of the others finished at least 4-9 single games against TUMRAK before he resigned his games. My games with him were accomplished with 7:3 and 7:5. Your games ended 1:0 both after one and a half months. You could have probably won your games too, but this way, these wins were gifts. This should not be criticism, you would have probably won this tournament very similar, but since you really need at least 2-3 times longer than others for a game, you take those points with you quite likely more often than others. Here is a list of humans who have achieved the highest peak values ââ(in brackets) in my rating. Next to it is the average thinking time per move in hours averaged over all games. Have I cracked 1600 yet? The answer you are seeking is here: http://bloederblitz.jimdo.com/ewn/ (and is no). The text files don’t seem to have that information. The .exe doesn’t seem to do anything. The gif is a year old. Ah, the exe did come up with a window minutes (Literally, about 200 seconds, I think) after I clicked on it. Thank you. However there’s still no way for a Windows user with normal screen resolution to make the scroll bars visible or to see the bottom and right of the window. Sorry Dvd, it’s a historically grown hobby-program. It wasn’t planned to make it available to others (maybe with different country/cultural settings, screen resolutions and so on). It’s running on a notebook with a screen resolution of 1600 × 900. This or a higher resolution should be quickly adjustable for most, and if not, every part of the UI should still be available by scrolling after maximizing the window. The program start takes so long because all data (results, scores, duration, number of moves and so on) of all EWN games from LG are read and in parallel, for example, the ELO numbers for all players after each completed game are calculated. The values are not saved because you are able to change calculation parameters like the k-factor. Optimized for a screen resolution of 1600 × 900. After unzipping the file in any folder and starting the exe you can find your current rating in the window at the right border. Displaced player names are inactive. The first number is your current ELO number, the number in brackets is your maximum. You can find your ELO curve by choosing your own nick in the upper (‘Player’) scrollbar. Afterwards, your win ratios against all opponents are available in the 2nd (‘Opponents’) scrollbar as well as the curve of a certain win ratio by choosing one of your opponents with the 2nd scrollbar. The curves are showing always averaged values. ‘25’ (games) is currently set. You can change this value in the ‘Average of last x games’-textbox but the curves must be redrawn afterwards by selecting the player again. The k-factor can also be varied, but all values need to be recalculated after that by clicking the ‘(New) ELO calculation’-button. However, I wouldn’t do that because beginners are pushed in the first 50 games, their starting ELO points are optimized for a k-factor of ‘3’. Next to the second scrollbar is a checkbox marked with a ‘t’ available, after choosing that option the averaged thinking time of a player is also shown in the diagrams. I have tried to divide the individual players (in a complex way) into 5 different playing strengths (levels) - taking the randomness of the game into account as well as the fact that even the best players are leaving LG someday forever (even if they still have open games => crash of points). The players of the higher levels are also part of the lower levels, they are always selected from the next level below. Normally, your win rate should be decreased against players in higher levels – except you’ve played just a few number of games against them. Your win ratios against specific player levels are shown directly below the 2nd scrollbar starting with level ‘0’ on the top. Your own level is shown next to the inactive scrollbar ‘TODO wie bei 1’. You can see of which players the group of a specific player-level consists by choosing the level with the ‘Player Level’-scrollbar. Only players of this level will be displayed in the first scroll bar then . Dvd, to answer your question, as LeCanardfou said, the answer is ‘no’ but you are currently the 4th strongest active player using that rating. However, your position can be changed with each finished game because the top 10 (actives – with at least one open game) are very close to each other. The best active humans are reaching at the moment an ELO number of about 1600. Since Jean Hebert (or 'John-Marc ‘Johnny’ McGregor' or Looser) left LG (and/or Jonny/OPMP tried his luck against the child in more than 500 single games) in the last months is there a gap of 50 points between the best bots and the best active humans. What means that the estimated value for a top 10 active human to win a game against one of the best bots is about 43%. This also correlates approximately with the win ratios in direct comparison. So, the method to take every match (rated and unrated) as well as all single games into account seems to work not bad. Here are the points of the best actives as well as the odds against RoRo as well as naive_child_c only. The other bots are either inactive or have played a few number of games only like jano_wol. Maximizing it won’t make it bigger than my screen size. And the scroll bars won’t appear, because they’re too far to the right and bottom to be within that screen size. Even id I stick the left end of the window out of the actual screen, I still can’t make it wider than the scree. In other words, if there are 2— pixels on the left I’ve moved off the screen, there will be 200 pixels on the right of the screen that I can’t expand the window into. I’ve never seen a program act like that before, but I haven’t tried such things enough to know if it’s normal. Probably gives me next to no chance, as the matches are 7 and 11 points and I’ve already lost the first game of each. I love playing against them though, and it’s no surprise that they’re doing so well in the current Championship. Interesting to see just how much better they are. Even accounting for the bots being the strongest players, I seem to do especially poorly against them, compared to other strong players. I wonder if I make a particular kind of bad play that is not exploited by most humans. It seems so that I should get in touch with any ‘autosize’- window and font options within the Microsoft Visual Studio which I’ve never used. Dvd, what screen resolution have you set? I’m going to watch how it looks like. I’ve replaced the download file. If the program is not working on your pc you can find 2 excel files in zip that include the summarized data of all players. Both files are consististing of the same data, the ‘.xlsm’ file is definitively working, the ‘xls’ file should be used by players with an older excel version only, but that file makes any minor errors because some formulas in the original are simply too complex/long. The player data are sticking in the ‘Rating (ALL)’ sheet, but there are so many numbers that I have prepared some overviews in diagrams. You can skip through the single player data by clicking on the arrows on the ‘Score win ratio vs.ELO’ diagram. However, macros must be enabled to do that. The macros sort the player data such that they are displayed correctly in diagrams depending on what you want to see (active players only, stats of the last 50 games only, and so on). If you’re clicking through the data/players you can see which player groups are approx.equal in strength but you’ll also see that each evaluation method leads to another player order. Beginners are definitively handicapped in the first games, the child played also worse one or two years ago, in these cases the last 50 games should give you the better idea about the current strength whereas strong players/bots who suddenly stopped playing are ranked on lower positions due to the timeouts. The truth is anywhere in between. You should not take the single odds against the bots too seriously because nearly all players have played a few games only against them. There’s still a tolerance of higher than +-4% even with 500 single games. That’s why I’ve summarized all games over all years. I’ve tried with the child so many different methods, some worked, others were mistakes which are of course also sticking in the odds. Some players were simply lucky to be very active at a time when a weaker version was running over weeks. For example, a weak experimental version was running when the last championship started in the last year and the first match was promptly lost before I could change the version. That was simply bad luck. The LG rating method is a poor choice for Ewn, producing results that are very erratic. Thanks, YHW, for making the match database available, in plain text, and easy to parse. I finally got around to writing some code to apply some proper ratings formulas to the data. I played with a few different approaches, and several parameters for each. I think i’ve found some methods that get closer to the Truth. I was a bit surprised by the significant margin between the top player and all the rest. Before i provide a rating list, would anyone care to guess the Ewn player that came out on top? YHW: BTW, there appears to be a few gaps in the match database, with the last game not always being counted in the game results (e.g. a 3-2 match showing as 2 / 2!). For example, our match 1451364, where i resigned the last game in a hopeless position. Here are a few statistics about the matches. darse, we are having a lot of time-out players! I wanted to count this fact by taking the finished games only into account. The last game – better said all games – are always counted, if a game was finished. If not (resigned or timed-out) the loser is always losing only one single match and not the rest of all matches until the target number is reached. That’s why the database includes 2/2 – results. Who’s the top player depends on the minimum number of finished games as limit to be in ranking. What time/(# games) you give to him to learn the game first as well as how he acts in the last games (sybil_c resigned the last games against all, Jean Hebert or other inactive players are still playing/losing games officially in any tournaments and also in database). I guess that both bots from the university Jena (fraggle & hanfried) are under the top 3 by taking all played games into account. The best in your ranking could be either Kitaktus or Telestes or Jean Hebert?! It’s no secret that the best Ewn players are bots. And with the large volumes of play, we can have a fairly high degree of statistical certainty about their relative strength, despite the highly stochastic nature of the game. (I had to deal with this problem a lot in my poker research). I think the data is pretty solid, even if a few games are dropped (that isn’t a serious systemic bias, it just reduces the sample size a little). With less data, noise dominates signal, so it’s largely speculation for who the best humans are. But yes, you’ve identified the probable best bets among humans, except that you forgot to include yourself. I expected that all the bots would be within epsilon of each other, but i was wrong, there’s actually a fair bit of separation between them. So, for geek pride, which bot do people back as the best of breed? I support the way you’ve counted the games, YHW. I was already planning to ignore games less than 5 moves, because they couldn’t be complete games. However, there was no need, because your game counts excluded all of those, and most other non-games. Thanks again for cleaning the data and making such an easy digest of the match results. That sounds good. I’m currently not sure (because I started to program this database/calculation many years ago without any documentation), I’m ignoring also games with less than 2 moves in any part of my evaluation... ;-) Less than 2 means that 1 player is definitively not playing anymore. Have you seperated your analyzes into the 3 different EWN variants? In this sample, the ‘2$’ means that the game was a ‘normal’ 3-points-match. "506567, Richard Malaschitz – Ray Garrison; 1002( 10407) 2$ 2006-03-10 19:55% 2006-03-11 22:35& 2 : 0. 3 / 1! 63"
6$ represents the ‘black hole’ variant, 7$ is ‘backwards Capture’, all other number are ‘normal’ games. BTW, this number in database helps also to detect whether a game has ended normally or not (resigned or timeout). Ah, thanks. That was the one field i couldn’t figure out. I looked at some original game score examples, but the code wasn’t obvious, so i just rated all of the matches together. I vote for first bot to be the Naive-Child, followed by Rororo. Nope. I’ll give it another day for guesses, while i split out the game types for separate analysis. 3  5-point match:   1123  0.012829   . 7  11-point match:    69  0.000788   . 8  19-point match:    88  0.001005   . 9  50-point match:  1001  0.011435   . 6  Black Hole:      1321  0.015090   . Feel free to put forward your nominations for highest rated human as well (notwithstanding the caveat on statistical uncertainty). There are two in the above top ten list (#6 and #9), which is for all game types mixed. The top player, and top bot, is RoRoRo the Bot. The top human on the above mixed list is kfiecio, but that is mostly due to his prowess in the Backwards Capture variant, where he is the #1 highest rated player. I’ve now rated the three variants separately. The top rated human for the standard variant is luiser, at #8. I’ll post a more detailed explanation of the methodology and top-N rating lists for each variation in a few days, when i get some time. For now, here’s the top 20 players for the standard game, without explanation of the three ratings. My playing strength today is far away from my (old) performance, but this looks very similar to the ranking of my program. Except that the current strengths and trends are also calculated. 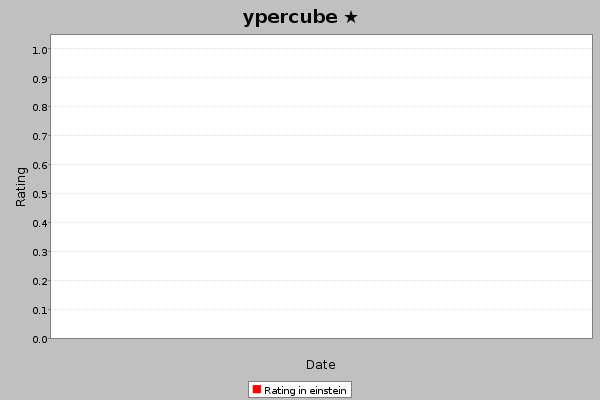 Thanks to your database, i can easily do the ratings over a more recent interval, such as the last year. Do you have any particular suggestions? With smaller volumes of play, there are two problems. First is the higher uncertainty, of course; but there is also a systemic bias. A good player may not yet have enough games for his rating to climb to its proper level, so many ratings are compressed toward the mean (i.e. toward 1500). The B-T column is the Bradley-Terry rating with a K factor of 4 (one eighth of the value used on Little Golem). That means a player winning a game against an equally rated opponent would gain 2 points instead of 16. However, K = 4 is still too high for satisfactory stability. The third rating is the FIBS (First Internet Backgammon Server) match rating, which also uses a 2000-point range and k = 4, but rates the match result as a whole (weighted by sqrt(m) for a match of length m). That makes sense for backgammon, because different games can be worth a different number of points, due to the doubling cube. However, that is a bad choice for Ewn, where every game is worth one point. Rating by match result simply throws away relevant and useful information, and we can see the much higher variance (i.e. instability) that results. I hope to do a proper write-up on the weekend, but that summarizes why i believe these ratings are much more reflective of proven skill than the LG ratings. With the ridiculously high K factor of 32, the LG ratings are really more like a “Who's Rolled Well Lately” trivia list. Don’t make yourself too much work. From my point, I’ve programmed myself everything I need. If any other calculation would produce a more useful rating/ranking I could/would implement it into my program. Thus it would also be available for all other players without the need to ask someone here in forum. I agree, the k-factor is still to high. I’m currently using ‘3’ but the oscilation in ELO curves seems still too high. A better choice would be 1-2 or even lower. At what date did you actually calculate the new points – when a game started or when it ended? â¢	Would you mind (YHW and/or darse) showing a top 20 humans-only list? â¢	For the robot programmers: I would be interested in the differences between a slow-advancing, very defensive style of play vs. a fast and risky style (perhaps defined as trying to create a fast “runner” who zooms through). Do the different bots on this site have differing strategies like this? Bump. Since I’m currently past the 1800 (up and down), I wonder if I am on the best 20 (active) human players too? I’m also up and down, but managed to get a rating of 1918 not long ago. I’m happy to admit that I had a lot of luck in the period leading up to this. This was briefly the highest rating (at the time), but it has since plummeted. It’s so hard to maintain a rating while playing actively though, unlike most games on LG even a complete beginner is capable of beating the best players. And I wouldn’t particularly class myself as being one of the best players anyway. Ah, I was afraid I wouldn’t make it: Yesterday I came to 1899, one point short of 1900, and after that, Diamante needed only one move to beat me. But happily he did not make his move until now, and I won my next game! 1908 points, 5th rating position. But only for a very short time I’m afraid... But anyway, finally member of the 1900+ club :-)). Next goal: winning a monthly cup. Perhaps, Richard did change the rating system?! On the other hand, all the 20 players with 1800+ look fine to me. 1900 (just, not 1 point more) for the first time. It is true that often I guard divided already gained. But it is to support a fixed line of points with so many items that I play my values they rise and go down very much and always I try to remain in 1700 points that I think that it is my normal punctuation. Finally, after 9 years of playing at LG, i broke the 1900 with 1905 !!!!! And, with no games where I am on move, I have to add. What has happened with YHW and his bot?? My Rating is "2034"
What is the matter with the ratings? Why are they going through the roof? Naive and YHW both just gave away 250 points. And many other players have time-outs. In my case it was merely a long winning streak. Naive_child and YHW didn’t give me any points. Time to stop playing EWN! After 3 years in the exclusive exactly-1900-high club, leaving with a new personal best, 1903. From 28-11 I was a happy 1900-plusser, top at 1922 (6th). Because I soon will lose again some game, I have to express my joy. I fear that tomorrow this position will already be lost, so now while I can I drink to my new top rating and postion...! !